Below, you will find a list of our awards, as chosen by the readers and editors of various magazines in Louisiana. 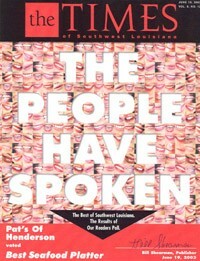 Be sure to pass the word on and stop by for a bite to eat at Pat’s of Henderson in Lake Charles, LA. 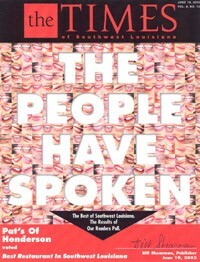 Pat’s is honored to receive the award for Best Restaurant in SWLA, 2003. 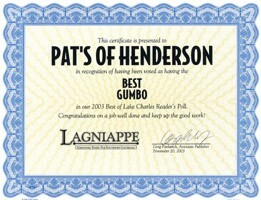 Our gumbo makes a great impression, thank you for voting Pat’s gumbo as the Best Gumbo in 2003.